So this week I started a giant project after somebody mentioned I should try large-scale artworks. So I challenged myself with a 48 x 36" canvas! It only just fit onto my easel. It's amazing how much a piece of cotton sat in front of you can intimidate you so much! But once I got in my groove I stopped feeling daunted and let me brush take over. I am still currently working on it but I wanted to show you photos of the journey up till now. I found this beautiful acrylic colour called Pistachio in my local art store, and even thought I don't paint in acrylic I just had to have it! So I started by toning the canvas with acrylic paint. This helps because the more layers to the painting, the richer in depth and colour it is. It also stops it looking too canvassy (that is so a word) and makes it a bit more thick-paint looking. Then I started to draw in the flowers and tried to envision it before I started to make sure everything was in the right place. I used flowers from all different photos and created my own bouquet of my favourites. I put together probably about 15 different images to create this bouquet. I adore the bold brush marks which give it an impressionist twist. I applied thick paint on the petals to make it have an impasto effect, which just leaves you wanting to touch it all the time. So far I've spent about 12 hours on it, and there's still quite a bit of work to do. As I stare into the flowers, whilst making my brush marks, I can feel myself being sucked in and lusting over more pretty petals. It has that effect on you, when you just want to keep staring at in whenever you're in the room. This is not the last time I will be doing large-scale artworks for sure! 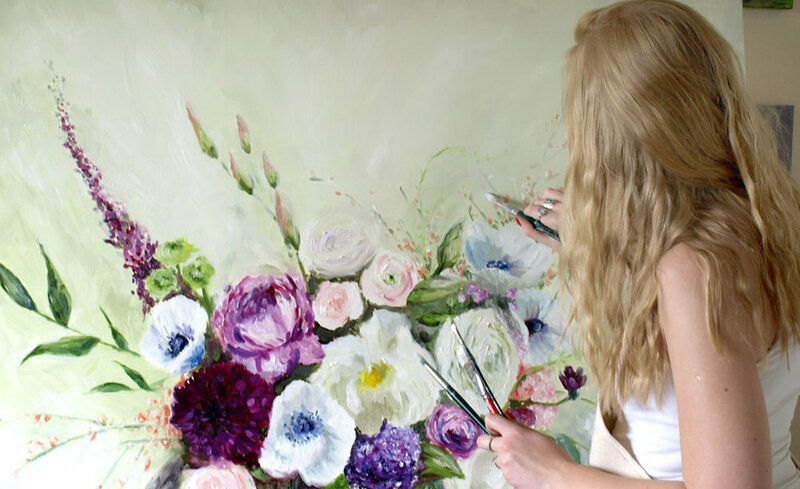 If you would like a commissioned painting of one similar in colours or flowers of your choice just email me at shop@katiejobling.com and I can give you some more info about it. You can keep up-to-date with my progress by following me on Instagram or Twitter. If you are interested in purchasing this oil painting also email me at shop@katiejobling.com.